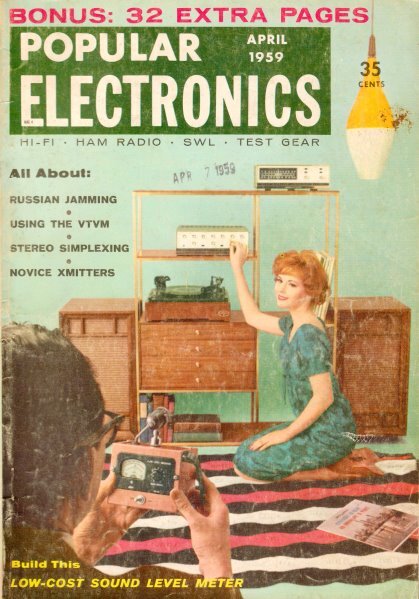 Power transformers have not changed too much since this article was written in 1959. Efficiencies might be up a bit, and maybe sizes down, but other than that, the equations and implementation methods are about the same. True, you will not find a lot of new transformers with secondaries that sport vacuum tube filament and plate voltages, but their equivalents for ±15, ±12, ±5, etc. are there. Power Transformers - those bulky heavy, and expensive items - are found in all types of electronic equipment. Whatever your interest in electronics, you're sure to have noticed one or more of these steel-clad components quietly humming to itself off in a corner of the chassis. When a replacement is needed, or you're searching for a particular item for a construction project, it's necessary to know the inside story of the power transformers; how interchangeable are the units and what do the specs mean? The purpose of a power transformer is simply to convert the a.c. line voltage into the higher and lower voltages required by electronic circuits. The two types you'll come across are known as high-voltage plate and filament transformers. In receivers and amplifiers you'll find the functions of both combined in a single multiwinding general-purpose unit. A typical power sup­ply is in Fig. 1. Size and Frequency. Physical size of a power transformer depends upon both its power handling capacity and operating frequency. The higher the unit's power rating, the larger the diameter of the wire needed in its windings and the greater the amount of iron laminations in its core. A transformer designed to power a one-tube audio preamplifier may measure a little over an inch on each side and may weigh but a few ounces. However, the power transformer of a moderately large television receiver will measure several inches on each side and be quite heavy. The lower the frequency, the more iron is needed in the transformer core to maintain operating efficiency. Hence, transformers designed for 25-cycle line operation are larger and heavier than the more familiar 50-60 cps units. Since higher frequency transformers require less iron, military equipment transformer frequencies may range from 400 to 1000 cps. Unless you live in an area supplied with 25-cycle power (a common frequency of hydroelectric power plants), the chances are you use 60-cycle transformers in all your projects. However,400-cycle (or other high frequency) transformers are encountered on the surplus market. As a general rule, a transformer will overheat, and may burn out, if used at frequencies appreciably lower than those for which it was designed. Thus, a 60-cycle transformer may overheat if connected to a 25-cycle line, as will a 400-cycle transformer connected to a 60-cycle source. Fig. 1. Schematic wiring diagram of a typical power supply. Specifications. Aside from operating frequency, a power transformer's electrical specifications are given in terms of primary voltage, secondary voltages and rated currents. In some cases, the unit's power-handling capacity may be indicated in watts or volt-amperes (va.=primary voltage multiplied by current in amperes). A typical filament transformer may have the following specifications: Primary, 105 - 120 volts, 60 cycles; Secondary, 6.3 volts, CT, 2 amps. Such a transformer is designed for operation on a standard 60-cycle power line. Although line voltage is nominally 115 volts, it may vary from 105 to 120 volts, depending on local conditions. This unit's center-tapped (CT) secondary winding has a nominal rating of 6.3 volts, and is capable of delivering a current of 2 amperes without overload. 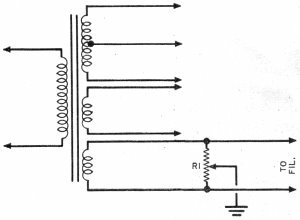 The exact secondary voltage will vary with the applied primary winding voltage and the secondary load. If overloaded, the transformer will supply more than 2 amperes, but the voltage will be low and the unit may overheat. Conversely, if less than 2 amperes are drawn, the secondary voltage may be somewhat higher than 6.3 volts. Frequently, the presence of a center tap is indicated in the secondary voltage specification rather than the abbreviation of "CT". For example, a transformer might carry the following specs: Primary, 105-120 volts, 60 cycles; Secondary, 350-0-350 volts, 50 ma. This transformer has a standard primary winding and a secondary winding delivering 350 volts on each side of its center tap; rated secondary current is 50 milliamperes. The secondary winding could also be described as 700 volts-CT, 50 ma. Fig. 2. 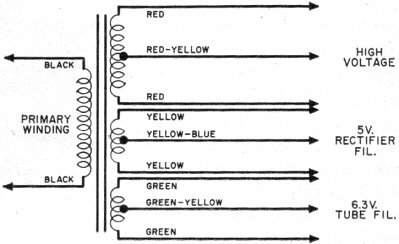 Standard color coding for power transformer leads. Where a multi-winding power trans­former is used, such as in Fig. 1, the voltage and current rating of each secondary winding are listed separately. A typical set of specs reads as follows: Primary, 105-120 volts, 60 cycles; Secondary No.1, 300-0-300 volts, 50 ma. ; Secondary No.2, 5.0 volts, 2 amps; Secondary No.3, 6.3 volts, CT, 3 amps. Lead Identification. Connections to transformers are made to fixed terminal lugs or to wire leads. If you purchase a new transformer, you'll find that lead connection instructions are printed on the box, on a label on the transformer, or on a separate sheet. But if you have a transformer salvaged from another project or taken from a piece of used equipment, these connections probably will have to be determined anew. If the unit is of recent manufacture, and equipped with color-coded leads, you can identify the leads by referring to the standard power transformer color code given in Fig. 2. Filament center taps are not included in all transformers. Fig. 3. Basic test which you can make to identify power transformer windings using an a.c. voltmeter. Fig. 4. Two tricks to use in making emergency substitutions: (A) two filament windings can be connected in series to supply higher voltages; (B) a filament winding can be connected in series with the primary to lower all secondary voltages. If the transformer is not equipped with color-coded leads, a simple technique will indicate which is which. With the transformer disconnected, use an ohmmeter to determine pairs of leads and center-tap connections. Check the resistance of each winding. The winding having the highest resistance is usually the high-voltage secondary and may read from 25 to several hundred ohms. The winding having a medium resistance - generally from 5 to 25 ohms - is the primary. Finally, the lowest resistance windings, usually less than I ohm, are the filament windings. Having made a tentative identification, connect a standard 100-watt lamp in series with the leads chosen as the primary leads and a source of line voltage as in Fig. 3. The lamp should light, but not at normal brilliance. If it lights to normal brightness, either the transformer is shorted (and should be discarded) or you've made an error in choosing the primary leads. Next, using an a.c. voltmeter, check the voltage across each winding, including the primary. The ratios of these voltages will help you to identify the windings. Fig. 5. How to obtain an "artificial" center tap on a filament winding. As a final step, remove the series lamp, applying full line voltage to the transformer primary. Use your a.c. voltmeter to check the unit's output voltages and to identify each winding positively. Remember that the voltage will read slightly higher than normal because of the absence of a load. Making Substitutions. A substitute power transformer should be used only if the specified component is unobtainable. When choosing a substitute, make sure that its secondary voltage specifications are the same and that its current ratings equal or exceed those of the original. For example, a transformer with a 250-0-250 volt, 60-ma. secondary may be used as a satisfactory replacement for a unit rated at 250-0-250 volts, 40 ma. Similarly, a filament transformer rated at 6.3 volts, 3 amperes, is a satisfactory substitute, electrically, for a unit rated at 6.3 volts, 1.5 amperes. A 5% difference in secondary voltage ratings will usually not affect circuit operation. Thus, if a project calls for a transformer rated at, say, 360-0-360 volts, substitutes with ratings of either 375-0-375 or 350-0-350 generally will be satisfactory. Where a special transformer having several secondary windings is required, and an exact duplicate is unobtainable, separate transformers can be used in place of the single multi-winding unit, provided that adequate mounting space is available. The transformer's 117-volt primary windings are connected in parallel. If special filament or bias voltages are required, two (or more) windings can be connected in series to supply the necessary voltages, as shown in Fig. 4(A). Connect adjacent winding leads together temporarily and check the output voltage obtained between the "free" leads, using your a.c. Voltmeter. If the output voltage is less than expected, the windings may be "bucking." In this case, interchange the connec­tions to one winding. It may be necessary to reduce the circuit's B+ voltage after installing a substitute transformer. There are several ways of doing this. A small resistor (5 to 25 ohms, 10 watts) can be connected in series with one of the primary leads, or the effective turns ratio of the transformers can be reduced by connecting one of the filament windings in series with the primary, as shown in Fig. 4(B). 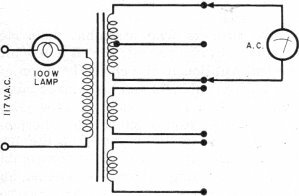 The preferred methods would be to substitute a rectifier tube with a larger internal voltage drop or lower the value of the input filter capacitor (C1 in Fig. 1). If the hum level in the d.c. output goes up; raise C2's value. Often, a center-tapped filament winding may be needed, but may not be available on the substitute transformer. In such a case, an electrical "center-tap" can be obtained by connecting a 50-to-100-ohm adjustable wire-wound resistor across the filament winding, as shown in Fig. 5. The adjustable tap is centered on the resistor. It is not necessary to use all the windings available on a multi-winding power transformer. For example, suppose you need a general-purpose power transformer, and find one with secondary specifications which match those of the needed unit but with an "extra" 6.3-volt filament winding. Simply ignore the extra winding, taping its leads to one side (taking care that they do not short together). Mechanical specifications are important only when the substitute unit is used as a servicing replacement or in the construction of equipment where the component's physical size and shape are important. These specifications include overall dimensions, weight, and type of construction or mounting.